Graphical User Interfaces (GUI) were an up and coming concept in the 1980s. 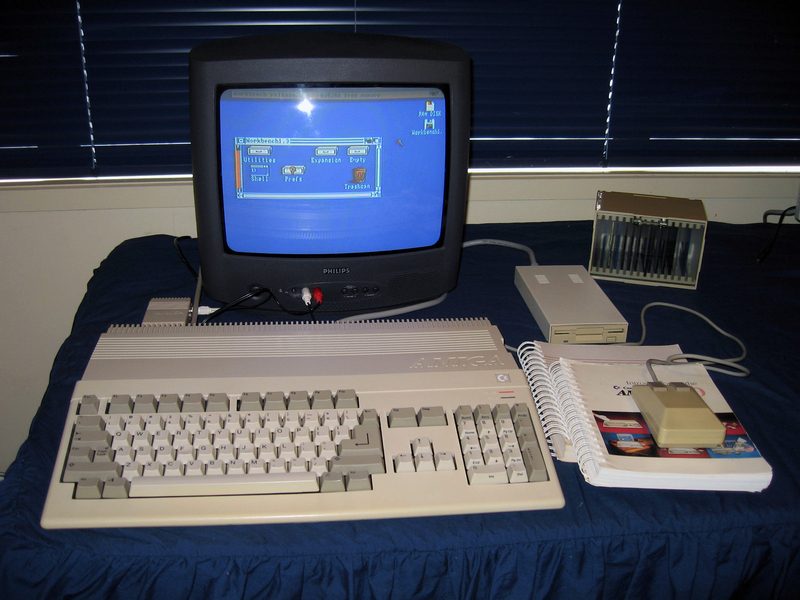 The Amiga 500, cheapest in the line of Amiga models from Commodore, introduced this in style to the home market in 1987. With a full-blown professional keyboard, a Motorolla 68000 32/16 bit chip, graphics rivaling the VGA standard in PC business machines, custom multimedia chips and stereo sound, the Amiga 500 was soon making friends. A full set of documentation and a small library of software came with this unit. Given the bytes needed for a GUI, the lack of a hard drive is somewhat of a handicap for the Amiga 500, but it is compensated for a little in this particular one by a 1MB memory upgrade and an external 3.5 inch floppy drive. The latter accessory was rather unreliable until I resoldered the on-off switch. It now works just fine!. I've bought some game disks and made a few more from images off the Internet just to keep it company. The picture above was taken before I took ownership of a decent Commodore monitor. I now have a 1084S model which makes using the machine much more of a pleasure than with the composite adaptor and TV. Actually I now have two Amiga 500s. The other is a 500+ model and I've hooked that up with a HxC floppy disks emulator. You can see that one (and read more about the emulator, and see the 1084S in action) under this link. This machine was quite popular in New Zealand. As far as history goes it is one of the last examples of the "home computers", a line that became extinct once multimedia MS-DOS machines fell in price AND people started to buy video dedicated game consoles again, like the Sega master system and Nintendo. The Amigas were notable for being real alternatives to the Mac and PC lines that were dominant in the late 1980s. Too bad they weren't taken more seriously by the mainstream.